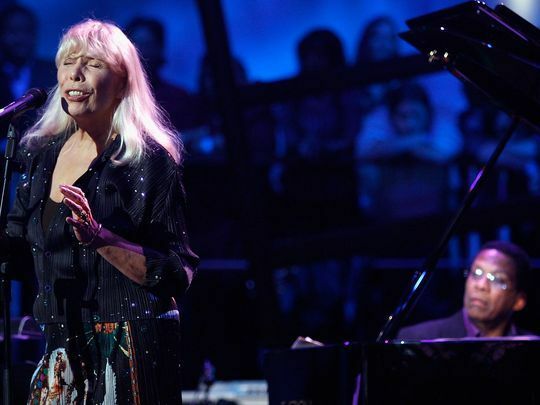 How do you remember Joni Mitchell? With her long blonde hair, lilting soprano and acoustic guitar, the enduring image of the singer-songwriter icon is one that dates back to the late '60s or early '70s. Like an insect trapped in amber, the Mitchell that new generations of fans have discovered, and fallen in love with, has been the artist as a 28-year-old waif. Many decades after her eight-album creative zenith - consisting of Song to a Seagull (1968), Clouds (1969), Ladies of the Canyon (1970), Blue (1971), For the Roses, (1972), Court and Spark (1974), The Hissing of Summer Lawns (1975) and Hejira (1976) - Mitchell remains among her generation's greatest songwriters for her music's beautifully articulated honesty. But while fans and critics often gloss over the ensuing 40 years, nostalgic for an earlier version of their icon, those subsequent decades are granted equal treatment by author David Yaffe in his new biography, Reckless Daughter: A Portrait of Joni Mitchell (Sarah Crichton Books/Farrar, Straus & Giroux, 376 pp., ★★★½ out of four). With Reckless Daughter, Mitchell's life gets an honest retelling befitting her music. The bio is a comprehensive portrait of the 73-year-old singer, starting with her childhood on the windswept plains of Saskatoon, Canada, and concluding with her final healthy years in Los Angeles before she suffered a brain aneurysm in 2015, as Yaffe digs into parts of her story that aren't as familiar to fair-weather fans as her youthful folk years. Those years are still vividly portrayed, with plenty of pulp included about Mitchell's revolving door of love affairs with many of rock's biggest names. In dueling interviews (she granted Yaffe access), Mitchell and her Laurel Canyon-era lover Graham Nash play he-said she-said over their relationship's details. Mitchell looks less fondly upon James Taylor, who struggled with substance abuse and was "incapable of affection," and Jackson Browne, whom she brands "the very worst one." As engaging as it is to revisit Mitchell's critical peak, following her all-star tours and peeling back the layers of her classic hits from that era, the second half of Reckless Daughter is more illuminating. Yaffe depicts the often-difficult decades that followed Hejira, from Mitchell's '70s jazz experimentations to her more computerized pop in the '80s. These are rarely the albums that young listeners turn to for their introductions to Mitchell's music, yet Mitchell's thorny personae during those years are just as essential to our collective understanding of the artist. Looking beyond Mitchell's Blue-era heyday exposes a more complicated singer, as "selfish and sad" as her landmark album once declared. This Mitchell found kindred spirits in the jazz performers of the time, sometimes controversially, like when she painted herself in blackface for the cover of 1977's Don Juan's Reckless Daughter. Yaffe maintains reverence and respect for Mitchell - almost to the point of fawning, at times - even as he tells the more problematic parts of her story, particularly those about her inscrutable attachment to her "Claude the pimp" character, writing that Mitchell entertained opening her never-published memoir with the line, "I was the only black man at the party." While Mitchell has recovered from her aneurysm, making a rare appearance at Clive Davis' Grammys gala earlier this year, the artist has largely retreated from public life. The deeply felt Reckless Daughter, dedicated to Mitchell's immense intellect and caustic wit, is a celebration worthy of the artist and her music. This article has been viewed 1,116 times since being added on October 27, 2017.